We’ve also managed to iron out quite a few bugs that were causing the top banner to sink slightly in firefox, and causing the text to be formatted incorrectly on quite a few pages. Most should be fixed, but if you find any more lingering problems, please email us so it can get sorted out straight away. Niczy’s Video Blog is another great new addition to the site, expect many more cool videos to be posted on a regular basis from now on! The existing shred videos page has been tidied up and has had a few parody videos added that are worth watching, although most of the fresh material will be on Niczy’s Blog so subscribe to that via RSS if you have the button on the latest Firefox and Internet Explorer browsers. In the pipeline at the moment are quite a large number of reviews soon to go on the site, all the ones coming soon are displayed in a special section on the album reviews page. We have quite a few artists that have offered brand new lessons for the site, for example Alex Oliva is currently preparing some video lessons for us that should be great. If you’re a shred artist and you want to help us out with new lessons, please get in touch ASAP! What we’d like from everyone else is more user submitted lessons! The ones we’ve had so far have been great, and we’re looking forward to hosting even more on the site. The interviews section will be expanded soon to feature a lot more artist interviews, we’re hoping to get all the contributors interviewed so you get to know the artists behind the lessons a lot better. At some point I’d like to redesign the lesson sections so they feature lessons in groupings of style, as opposed to just which contributor submitted them. An exciting idea me and Niczy have had while discussing the site, is this summer the introduction of an exclusive shred podcast on Shredaholic, featuring discussion of what’s new, any issues that Shredaholics want to raise, and brand new music from up and coming shred artists. This would be quite a unique idea that no other shred website is doing at the moment, and should offer Shredaholic, its visitors and shred artists to connect a lot better. Check out the industry section for news on Mike Campese’s new DVD, and any other forthcoming news that might follow after this news bulletin. Thanks goes out to Laurie Monk at Truth In Shredding, who posted a news bulletin about our return. 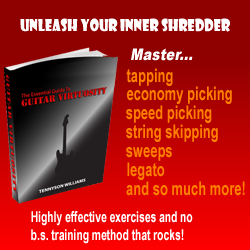 Great shredding blog if you’ve never visited it before, definitely recommended by Shredaholic.com. We’re up to 750 visitors a day (from 450 in January), and that’s climbing rapidly. Things are looking up for Shredaholic.com!